BCG matrix is a matrix used by large corporations to decide the ratio in which resources are allocated among various business segments. Similar to this, GE matrix also helps firms decide their strategy with respect to different product lines, i.e. the product they should add in the range of products offered by them and in which opportunity the firm should invest. Both BCG matrix and GE matrix are two-dimensional models, that are used by big business houses, having several product lines and business units. The latter was developed as an improvement over the former, and so overcomes many limitations. This article excerpt will help you understand the differences between BCG and GE matrices, take a read. Meaning BCG Martrix, is a growth share model, representing growth of business and the market share enjoyed by the firm. GE Matrix implies multifactor portfolio matrix, that assist firm in making strategic choices for product lines based on their position in the grid. Objective To help companies deploy their resources among various business units. To prioritize investment among various business units. Measures used Single measure is used. Multiple measures are used. BCG Matrix or otherwise known as Boston Consulting Group growth share matrix is used to represent the company’s investment portfolio. The growth rate of the product-market. Market share held by the company in the respective market, in comparison to its competitors. BCG Matrix helps the corporation in analyzing the product lines or business units, for prioritizing them and allocating resources. The model aims at identifying the problem of resource deployment, among different business segments. In this approach, various businesses of a company are classified on a two-dimensional grid. The vertical axis shows market growth rate, which is a measure of how attractive the market is? The horizontal axis indicates relative market shares, which is an indicator of how strong the company’s position is? Stars: It represents those products which are growing at a faster rate and requires the huge investment to maintain their position in the market. Cash Cows: The products whose growth is low but holds high market share. They reap a lot of cash for the company and do not require finance for expansion. Question Marks: It indicates those products which possess a low market share in a high-growth market and so need heavy investment to hold their share in the market, but do not generate cash in the same proportion. Dogs: Dogs represents those products, which neither have a high growth rate nor high market share. Such products generate enough cash to maintain themselves but will not survive in the long term. GE matrix, alternately known as General Electric Model is a business planning matrix. The model is inspired by traffic lights which are used to manage traffic at crossings, wherein green light says go, yellow says caution and Red say stop. The matrix comprises of nine cells, with two major dimensions, i.e. business strength and industry attractiveness. Business strength is influenced by market share, brand image, profit margins, customer loyalty, technological capability and so on. On the other hand, industry attractiveness is influenced by drivers such as pricing trends, economies of scale, market size, market growth rate, segmentation, distribution structure, etc. When various product lines or business units are drawn on the matrix, strategic choices can be made, on the basis of their position in the matrix. Product falling into green section reflects the business is in the good position, but product lying into yellow section needs the managerial decision for making choices and the product in the red zone, are dangerous as they will lead the company to losses. BCG matrix can be understood as the growth-share model, that reflects a growth of business and the market share possessed by the firm. On the other hand, GE matrix is also termed as multifactor portfolio matrix, which businesses use in making strategic choices for product lines or business units based on their position in the grid. BCG matrix is simpler in comparison to GE matrix, as the former is easy to draw and consist of only four cells, while the latter consist of nine cells. The two dimensions on which BCG matrix is based are market growth and market share. 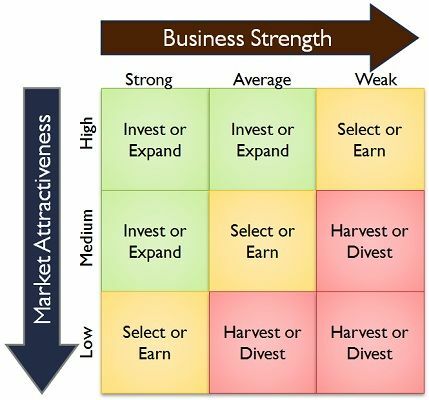 Conversely, industry attractiveness and business strengths are two factors of GE matrix. BCG matrix is used by the companies to deploy their resources among various business units. On the contrary, firms use GE matrix to prioritize investment among various business units. In BCG matrix only a single measure is used, whereas in GE matrix multiple measures are used. 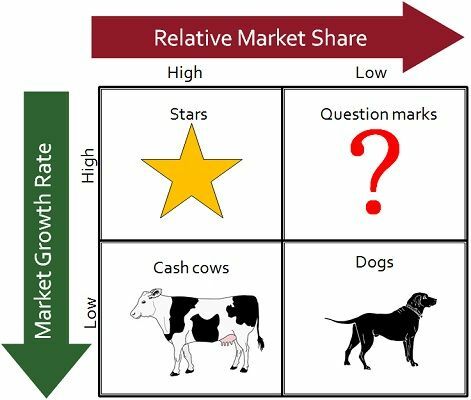 BCG matrix represents two degrees of market growth and market share, i.e. high and low. In contrast, in GE matrix there are three degrees of business strength, i.e. strong, average and weak, and industry attractiveness, are high, medium and low. To sum up, we can say that the two models are similar, but have some differences that cannot be ignored. While BCG matrix is simpler to plot and easier to understand, GE matrix is a bit difficult to draw and interpret. However, it is free from certain limitations of BCG matrix.